I guess 9 beautiful shots will make a stunning photo. What a gorgeous place!!! What a beautiful place to spend Christmas. I like the light and colours. The water looks so mysterious. I love the colors. The reddish brown makes the blue green pop! Fantastic image and great for a HDR… doesn\'t show any of the "unreal" feel that these photos can have when not done properly. Thanks for posting your fantastic photos! 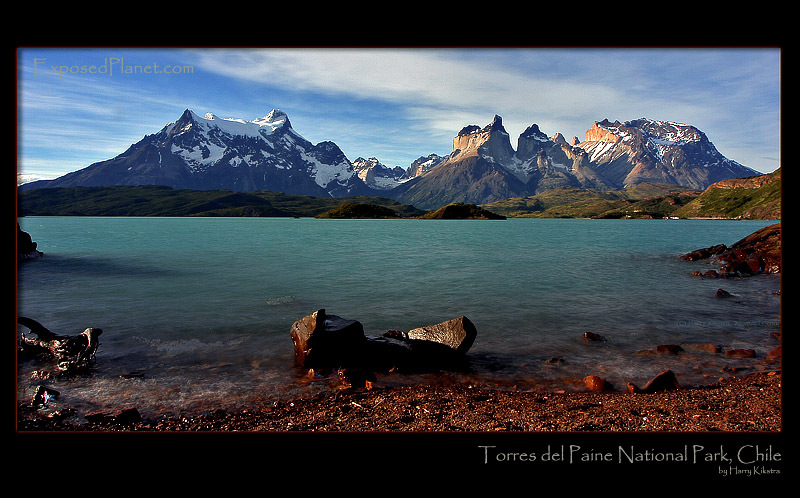 The story behind "Torres del Paine, Chile"
I spent X-mas here, this shot is taken from the beach of one of the campsites in the Torres del Paine National park, Patagonia. Not crowded at all, I sat here alone for a few hours, the wind pounding on my face, but with a view like this you hardly notice.. This is actually a combined HDR/pano image. HDR means that I shot several images with different exposures, combining them in photoshop. As I did this for 3 different shots, which overlapped to create this image, the above is actually composed of 9 different shots! As this process removes the tech info: taken with 24mm Tilt/Shift lens, 25 Dec 2005, aperture/shutterspeed not known anymore..